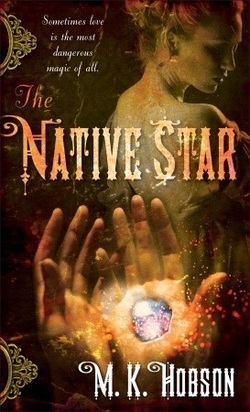 I was pleasantly surprised by The Native Star - it was not really what I was expecting. I don't know if I would classify this book as straight fantasy or straight steampunk or straight western or what. It's a fantasy, steampunk, western book with elements of romance and (of course) zombies. Ok, so the zombies are only in the novel for a hot second but I felt they warranted a mention. In The Native Star, Emily Edwards is a Witch for a small community on the Western frontier. Times are tough for her and her adopted father and in a desperate bid to increase their station in life, Emily casts a love spell on the local, rich lumberman, Dag. The resident pompous Warlock, Dreadnought Stanton, is quick to haughtily point out that her love spell is way too strong. Through a series of events, Emily and Dreadnought find themselves in a mine full of zombies where a glowing crystal stone embeds itself in Emily's hand. Understandably, Emily is upset of the geological implant and she and Dreadnought embark on a mission across the West to learn more about the stone and try and remove it from her hand. Along the way a band of evil Warlocks catch the scent of the magical stone and try any means necessary to recover the stone. Emily and Dreadnought struggle to evade the evil ones while discovering their feelings for each other may run deeper than they had originally thought. This was such a well thought out book. The magic system and world building are probably the best elements - they are very indepth and rich. Hobson creates a mid 1800s world where magic and steampunk seem not only normal, but also necessary for the function of society and life. I found myself wanting to learn more about the world, the magic, and the stone in Emily's hand. I found the characters to be done well, too. They weren't your average fantasy characters which was refreshing. This novel definitely focused more on the magic and the plot rather than the romance which was a nice change. I think there could have been more romance in the story, but at the same time, it's nice to read a book that focuses on plot rather than on just the steamy scenes. The only thing that bumped this from a four-gnome to a three-gnome for me was that the book was slow to read. It wasn't "slow so I'm going to put it down"...it was "I've been reading for how long and I only got through 20 pages?! "...I'm used to breezing through books much more quickly. I think the world building and magic system required me to slow down so I could digest the content and, while that is not a bad thing at all, I didn't like having to do that for this book.